A friend from work asked if I would make Baby Shower invites for a friend of hers. She wanted a few examples today, but I only had time this week to make one. I used white cardstock, the swiss dots cuttlebug folder, lemon tart satin ribbon from paper trey ink, the scallop circle is Certainly Celery SU cardstock and I used a 2in scallop punch. 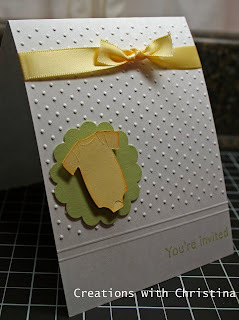 The cute little onsie is from the New Arrival Cricut Cartridge cut out on Lemon Tart cardstock. Absolutely darling card. Thank you for sharing. Christina,cute card. wish I knew someone who was having a baby, because I would so want to scraplift this one. Very cute card! I love the white. Did you use a score pal to do the lines? I really like that look.